Canva https://www.canva.com/ is an fairly easy web program for creating graphics for all your social media sites. It has built in templates for all the major social sites and plug in graphic you can use. It’s mostly free, but some of the graphics do have a charge if you decide to use them. It also sends you information once a week on how you can use it better. Feedly http://feedly.com/ is a simple to use for RSS feeds. Many of us were a little lost after Google shut down it’s reader. This is a good replacement. Jpegmini http://www.jpegmini.com/ is a freemium web app for reducing the file size of JPEG photos. It’s free for up to 20 photos per day. It can reduce the file size of photos up to 5x without losing any quality. This can really improve your sites load time and help your SEO. What would I say? http://what-would-i-say.com Facebook app that automatically generates FB post that sounds like you. This app is a little silly, but fun. Your should check it out. 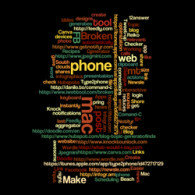 Wordle http://www.wordle.net/ is a free app that makes word clouds. You can either add words yourself, or just put in a URL and it will create a wordcloud. It’s a great time saver for bloggers! The image for this post was created with it. Broken Link Checker http://www.iwebtool.com/broken_link_checker tool to check for broken links on a website. It’s a really good time saver to make sure that all your links are up to date on your site. Doodle http://doodle.com/en/ is a free online scheduling tool. Are you tired of sending a gazillion emails back and forth to schedule a group meeting? This is your answer! If then, then that https://ifttt.com is a service that lets you create powerful connections with on simple statement. Create recipes between other apps that can save you time. Do you want a text message if there is a hurricane warning in your area? This is how you would do it. Newsle http://newsle.com is is Google Alerts on Steroids. Input your connections (FB, LI) and get an email when they are in the news. You can schedule it to notify you once a day or once a week. It up to you. It’s a great way to keep up with all your connections. Infogr.am http://infogr.am/ is a free app that creates interactive infographics. It has a built-in spreadsheet for easy data edity, or import you X>s,X>AX and CSV files. You can save the infographic to you computer as PNG or a PDF file. It’s great to share them on the web in blog posts or Pinterest. Hubspots Blog Topic Generator http://www.hubspot.com/blog-topic-generatorf helps you find relevant blog post titles. If you are suffering from writers blog, here is an easy way to break out of it. SEOQuake SEO extension for firefox. It’s primarily for web masters who deal with SEO and SMO. It allows you to investigate may important SEO parameters. Pippit pippit.co is sort of a mix between Pinterest and Twitter. You can use it for aggregating social media assets. Fiver, fiverr.com. Get things done for $5 dollars. Want a clay image of your logo? A press release for your next event? Find all kinds of services for $5, or put up a service you will do for $5. It’s a pretty fun site! There were a couple more related to website speed and performance that were really useful, but those will have to be covered in another post.